My freshman year in high school, I fell in love with Kurt Vonnegut. Well, I fell in love with his writing, not the man himself...and, yes, the primary reason I wanted to read Slaughterhouse Five was because it was one of "those" books. You know, the ones behind the counter that required a note from your mom in order to check out of the school library. 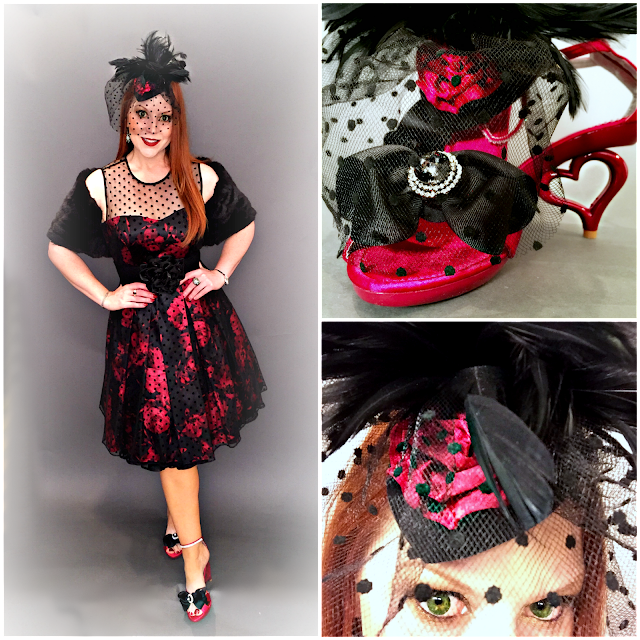 Because I'm rarely satisfied with things "just as they are," the red satin rose on my cocktail hat is actually a removable clip that came with these pumps featuring heart-shaped heels. The grosgrain bows on my shoes, ironically enough, are made from children's hair barrettes and a pair of clip earrings. So, yeah, I've got a shoe clip on my head and hair bows on my feet...seems about right. In my sophomore English class, I chose "Johnny Got His Gun" by Dalton Trumbo, for a book report, probably because I was fascinated by banned books and blacklisted authors at the time. An anti-war novel whose publication was suspended during WWII, Johnny Got His Gun chronicles the inner thoughts of a man injured in war and trapped in his own mind, unable to communicate though completely aware of what was happening to him. It was also the primary inspiration for Metallica's song, One, oddly enough. I didn't love the book the way I love Slaughterhouse Five, but it haunted me for years, and remains one of the most disturbing pieces of literature I've ever read. 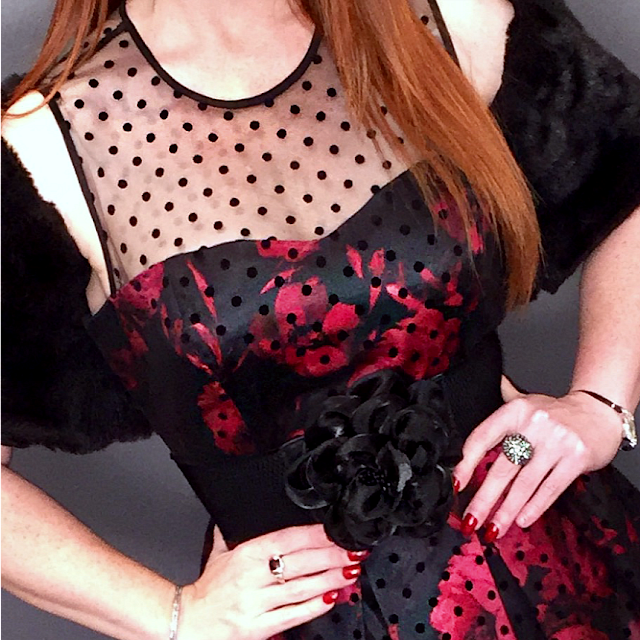 Though I didn't buy them together, nor did I have one in mind when I purchased the other, I love the repetition of the polka dots in the tulle overlay of the dress and the birdcage veil of the cocktail hat. 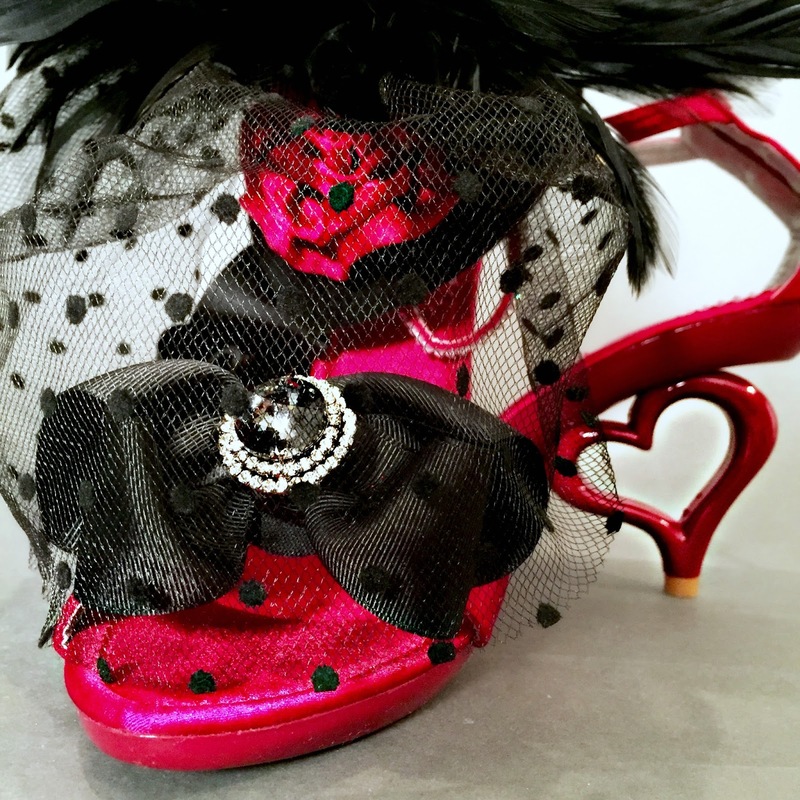 Using the red satin shoe clip to embellish the hat and replacing it with black grosgrain bows on the shoes carried the red and black color scheme from head to toe. Later, in Mrs. Maxwell's AP English class, I fell in love with Greek mythology. I mean really fell in love. So much so that when I missed a single question on a single test in a college mythology class at IU, I argued my case to the professor until he gave in and agreed that my interpretation of the question was logical, even though not the answer he was looking for. Not that the "A+" vs. the "A" made a difference in my GPA. But, I know my Greek mythology, people, and I just couldn't let it go. Crystal encrusted clip earrings from local Indianapolis boutique Secret Ingredient echo the crystals on the ankle straps of these satin heels. So, when I was recently invited to the world premier of the operatic version of Vonnegut's play, Happy Birthday Wanda June, performed by the Indianapolis Opera, I jumped at the opportunity. First, it was Vonnegut; Second, like Johnny Got His Gun, it has an anti-war flavor; Third, its main characters are loosely based on Odysseus and Penelope; Finally, it was the opera, which meant it was a perfect occasion to break out a fun cocktail hat. Truly, how could I resist?! I'm linked up with Hat Attack, Visible Monday and Shoe and Tell! Thanks, Patti! I'm so happy to be part of Visible Monday - what an inspirational group of women! Your cocktail hat is fun and funky, the polka dots on the veil are like icing on the cake! The red clip on bow pops when worn with that dress! Thank you for participating in Hat Attack!